Allwave Lasers Devices Inc. established in Sept., 2010, have our headquarter and R&D in Silicon Valley of USA and pilot-run proved mass production in Xi’an of China. We provide unique product solutions in lasers, PLC splitters, C/DWDM, Thermal and Athermal AWG. Our team has great experience and strong track-record in photonic device design, reliability qualification, pilot-run to mass production.We also provide services in customized photonic product design, prototype, pilot-run production, Telcordia qualification and mass production. We are fully committed to provide cost-effective product solutions with excellent specs, quality and reliability. 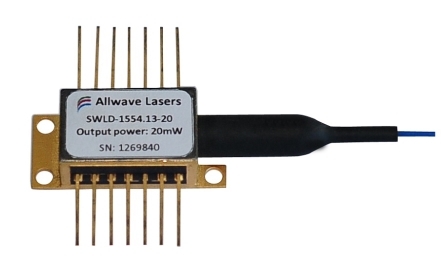 LAN-WDM laser diodes are 1295.56nm、1300.05nm、1304.58nm、1309.14nm Multiple Quantum Well (MQW) structured distributed-feedback(DFB) laser modules. Copyright 2016 by Allwave Lasers Devices Inc.